Publisher's Note: This guest post was written by James Copeland, executive director, emeritus, of the National Speech and Debate Association. He was a member of the Associated Press Presidential Debate Evaluation Panel, 1976-2000. He is the author of Cross Examination in Debate (1983) and has advised gubernatorial and congressional candidates about campaign debates. Donald Trump, like Eisenhower, Kennedy, and Reagan, is a leader, not a man of study. Men of study like Bob Dole, Jimmy Carter and Al Gore were good with briefing books and detail. But briefing books and practice debates are not the best way for Mr. Trump to prepare. Preparation for the next debate must be based upon Trump's considerable skills. His greatest skill was exhibited on “The Apprentice”, where Trump evaluated and judged the arguments of others. Trump is a counter puncher and this skill can be honed to create retorts to opposition arguments. 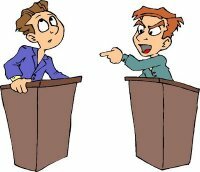 The retort is the most effective and dramatic argument that can be posed in a debate: It takes the PREMISE of the opponent's attack and turns it back against the accuser. Secretary Clinton insists I release my tax returns. I insist she release the transcripts of her speeches to Wall Street firms, which paid her thousands of dollars in speaking fees. How do we know what she promised them? She demands I provide transparency, yet she provides none. Secretary Clinton accuses me of not being truthful when I say I did not support the Iraq war. My opinion was that of a private citizen. I accuse Secretary Clinton of not being truthful about the Benghazi attack. Publicly she blamed the attack on an anti-Muslim video. Privately she tweeted her daughter, Chelsea, that it was a terrorist attack! She demands honesty from private citizens, yet refuses to provide it as a public official. 2] Facing Mr. Trump about ten feet away should be two side by side podiums. 3] At one podium is the Clinton surrogate; at the other a Trump surrogate. 4] Staff will have prepared a list of Clinton personal attacks on Trump and a retort for each. 5] Staff will have prepared a list of Trump issues, Clinton's rebuttal and Trump's retort. 6] Each surrogate will be scripted with the material prepared by staff. 8] MR. TRUMP WILL REFINE EACH RETORT ON CONTENT AND WORDING . 9] MR. TRUMP MAY DEMONSTRATE HOW HE WOULD SPEAK THE RETORT. 10] Roger Ailes should attend each session and privately offer his critique to Mr. Trump. 11] Each session will not last more than one hour (15 minutes for each issue). For James Copeland's assessment of the first debate between Hillary Clinton and Donald Trump, see this post on Bearing Drift: "Champion Debate Coach Assesses Trump-Clinton Performances." Publisher's note: This article was originally published on Examiner.com on October 21, 2012. The Examiner.com publishing platform was discontinued July 1, 2016, and its web site went dark on or about July 10, 2016. I am republishing this piece in an effort to preserve it and all my other contributions to Examiner.com since April 6, 2010. It is reposted here without most of the internal links that were in the original. With the third and final Democrat-Republican presidential debate approaching, Gary Johnson, the Libertarian Party's presidential nominee, said in an interview that such debates are “a waste of time,” also offering his thoughts about U.S. policy in the Middle East and North Africa. He also indicated that he may win a large percentage of votes in his native New Mexico. 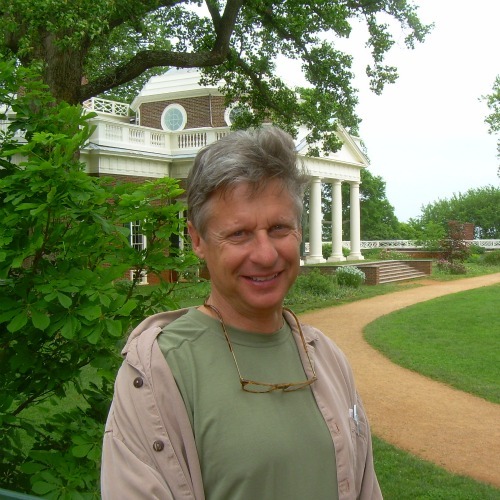 Johnson, author of the new book, Seven Principles of Good Government, spoke to the Charlottesville Libertarian Examiner during a recent campaign stop in Washington, D.C. Although a social gathering at The Board Room on Connecticut Avenue was meant for Johnson to engage with his supporters and campaign volunteers, he spent the greater part of the evening answering journalists' questions on a wide range of policy issues. In response to a question about radio and television advertising for his campaign, Johnson said he will soon be airing TV commercials “in areas we might actually win, or potentially taking second place” although “probably not” in Washington, D.C., despite that city's small number of Republican voters. Johnson also predicted his vote totals will be relatively high in some Western states and one Midwestern swing state. The first-time presidential candidate said he believes it is possible he could win more than 10 percent of the vote in New Mexico, where he served two terms as a Republican governor in a majority-Democrat state. In the foreign policy debate at Lynn University in Boca Raton, Florida, on October 22, the question of U.S. policy in Libya and reactions to the September 11 murder of Ambassador Chris Stevens and three other Americans will be in the forefront of the discussion, just as it was in the town hall debate at Hofstra University on October 16. Johnson has some strong views on what U.S. policy in that region should be. Publisher's note: This article was originally published on Examiner.com on October 25, 2013. The Examiner.com publishing platform was discontinued July 1, 2016, and its web site went dark on or about July 10, 2016. I am republishing this piece in an effort to preserve it and all my other contributions to Examiner.com since April 6, 2010. It is reposted here without most of the internal links that were in the original. Former New Mexico Governor Gary Johnson will be one of the primary speakers on Saturday, October 26, at a rally at the foot of the U.S. Capitol in Washington, D.C., to protest the expanding surveillance state. Known as “Stop Watching Us,” the rally at the Capitol Reflecting Pool will also feature such speakers as Michigan Congressman Justin Amash, gay-rights advocate Dan Choi, NSA whistleblower Thomas Drake, former Ohio Congressman Dennis Kucinich, national security analyst and author Bruce Schneier, and social critic Naomi Wolf. A video in support of the rally features celebrities John Cusack, Phil Donahue, Daniel Ellsberg, Maggie Gyllenhaal, Oliver Stone, and Wil Wheaton. Protesters are gathering from around the country, with buses carrying them from far-flung places like New York City, Philadelphia, and Charlottesville, Virginia. Two nights before the rally, the Charlottesville Libertarian Examiner spoke to Gary Johnson (who was also the 2012 Libertarian nominee for U.S. President) at a fundraising event for his non-profit organization, Our America Initiative. In the course of the interview, Johnson expressed his outrage at the growth of government surveillance of American citizens and violations of privacy and constitutional protections. “It's outrageous,” Johnson said, “that 125 billion cell phone conversations have been recorded or are authorized” to be archived for future probes. Instead, it is “some sort of blanket 'government-knows-best'” policy that leads to the government “search[ing] your personal archives” and doing whatever they like with it, without constraints. On another topic of recent concern, the temporary shutdown of the federal government that may recur in the near future, the 2012 presidential candidate explained what he would have said to the nation under those circumstances, if he were president. Johnson said that his personal philosophy – not being a social conservative while also being “arguably the most fiscally conservative governor” in U.S. history – helped him reach across the aisle and work with a Democratic legislature as a Republican governor. “I'm going to argue that” a libertarian philosophy like that “is reflective of most Americans and in a state that's two to one Democrat, [like] New Mexico, that resonates” with voters, he said. He offered his own experience as advice to Robert Sarvis, the Libertarian candidate for governor of Virginia this year. In addition to speaking at Saturday afternoon's “Stop Watching Us” rally in Washington, Johnson and Sarvis will make a joint appearance that evening at the IOTA Club, 2832 Wilson Boulevard in Arlington, Virginia, from 5:30 to 8:00 p.m. Publisher's note: This article was originally published on Examiner.com on April 25, 2010. The Examiner.com publishing platform was discontinued July 1, 2016, and its web site went dark on or about July 10, 2016. I am republishing this piece in an effort to preserve it and all my other contributions to Examiner.com since April 6, 2010. It is reposted here without most of the internal links that were in the original. Former Governor Gary Johnson of New Mexico will give a speech in Charlottesville on Monday, May 3, hosted by the Charlottesville Republican Committee, Albemarle County Republican Committee, and the Republican Liberty Caucus of Virginia. Governor Johnson will speak at the Northside Library in Albemarle Square at 7:00 p.m.
A triathlete who has climbed Mount Everest, Gary Johnson was elected to two terms as New Mexico's governor after a successful career as an entrepreneur. He is currently honorary chairman of the OUR America Initiative. The idea has been floated that Gary Johnson might run for the Republican presidential nomination in 2012, but currently he is not a candidate for any state or federal office. “As Governor of New Mexico, Johnson was known for his common-sense business approach to governing. He eliminated New Mexico’s budget deficit, cut the rate of growth in state government in half and privatized half of the state prisons. “Johnson also shifted state Medicaid to managed care (which led to better healthcare by creating a statewide healthcare network that previously did not exist and which saved money) and reduced state employees by over 1000, with no firings. During his term, New Mexico experienced the longest period without a tax increase in the state’s history. For more information about Governor Johnson's May 3rd lecture in Charlottesville, check out the event page on Facebook. The event is free and open to the public. Publisher's note: This article was originally published on Examiner.com on September 3, 2012. The Examiner.com publishing platform was discontinued July 1, 2016, and its web site went dark on or about July 10, 2016. I am republishing this piece in an effort to preserve it and all my other contributions to Examiner.com since April 6, 2010. It is reposted here without most of the internal links that were in the original. Former Virginia congressman Virgil Goode is running a populist campaign for President as the nominee of the Constitution Party, but first he has to face a hurdle in his home state, where the Republican Party is challenging the validity of the petitions Goode circulated to place his name on the ballot. The Republican challenge will be formally presented to the State Board of Elections at the board’s regular meeting on the morning of September 4 in Richmond. Goode spoke to the Charlottesville Libertarian Examiner at the annual Buena Vista Labor Day parade and candidates forum, saying his campaign is preparing a response to the GOP’s attempt to get him off the ballot. “We’re going to present a response to the State Board on [Tuesday], if they will accept it then,” Goode said. Drawing an analogy, Goode pointed to “the squelching of Ron Paul at the Republican convention” as a similar tactic by the GOP establishment. Goode affirmed that the State Board of Elections had found that his campaign did “have sufficient signatures statewide and in every district,” contrary to the assertions being made by Republican lawyers. Unless the Republican challenges are successful, there will be three third-party presidential candidates on the ballot in Virginia: Goode, Green Party nominee Jill Stein, and Libertarian Party nominee Gary Johnson. Goode said he parts company from the other two candidates. Goode’s goals for his presidential campaign are modest and ideologically populist. Although his career in politics in Virginia has spanned more than three decades, Goode expects to win more votes in other states. He added that he is “hoping to be on the ballot in New York and get some votes there” and that he is “on the write-in ballot in Texas. I think we’ll get some votes in Texas and North Carolina” where he is also a write-in candidate. Asked to reveal his preference in the U.S. Senate race in Virginia this year, where former Governors George Allen and Tim Kaine are facing each other, Goode demurred. Publisher's note: This article was originally published on Examiner.com on May 5, 2010. The Examiner.com publishing platform was discontinued July 1, 2016, and its web site went dark on or about July 10, 2016. I am republishing this piece in an effort to preserve it and all my other contributions to Examiner.com since April 6, 2010. It is reposted here without most of the internal links that were in the original. Former New Mexico Governor Gary Johnson visited Charlottesville on Monday, May 3, to give a speech sponsored by the two local Republican unit committees and the Republican Liberty Caucus of Virginia. Johnson, a two-term Republican who served from 1995 to 2003, is now honorary chairman of OUR America Initiative, a public-policy advocacy group. Prior to becoming governor, he was a successful entrepreneur who took a one-person handyman operation and turned it into a 1,000-employee contracting and construction company by the time he sold it. The former governor took advantage of his time in Charlottesville, appearing by telephone on the Joe Thomas morning drive-time radio show on WCHV and on Rob Schilling’s mid-afternoon radio program on WINA-AM. He also strolled along Charlottesville’s downtown mall, where he wrote a message about “freedom” and “liberty” on the First Amendment Monument near City Hall, and he made his first visit to Thomas Jefferson’s home at Monticello. The Charlottesville Libertarian Examiner asked Governor Johnson to reflect on his tour of Monticello. The word he repeated in his answer was “fascinating” in reaction to the many elements of Jefferson’s home. “I found it fascinating,” Johnson said about Jefferson’s design, “and I found it fascinating to see the quirks, if you will, in how it was built and all the fascinating elements”: the wind-direction indicator above the front porch, for instance, and the two-faced clock that Jefferson built for his entryway, a clock that tells just the hours on the outside but minutes, hours, and days of the week on the inside. Publisher's note: This article was originally published on Examiner.com on September 14, 2010. The Examiner.com publishing platform was discontinued July 1, 2016, and its web site went dark on or about July 10, 2016. I am republishing this piece in an effort to preserve it and all my other contributions to Examiner.com since April 6, 2010. It is reposted here without most of the internal links that were in the original. Gary Johnson, the former two-term Republican governor of New Mexico and current chairman of the non-profit Our America Initiative, was the only 2012 presidential contender to speak at the 9/12 Taxpayer March on Washington last Sunday. Because of his position as head of a tax-exempt group, Johnson demurs when asked if he’s planning to run for President. Nonetheless, a Facebook group called “Gary Johnson for President 2012” has 2,918 members and 47,900 Facebook members have clicked “like” on a page called “Gary Johnson – Our America" -- all potential supporters in a bid for the White House. In the past few months, Johnson has visited 27 states and spoken before at least 100 groups. He has appeared on radio talk shows and TV talking heads programs. Just prior to Sunday’s march, the Charlottesville Libertarian Examiner took Governor Johnson aside to ask him privately about pressing issues of the day and the mood of voters in 2010. The former New Mexico governor said he agreed with the assessment of the current governors of Indiana and Mississippi (Mitch Daniels and Haley Barbour, respectively), who have suggested that Republicans should de-emphasize divisive social issues and focus on economic matters. “If Republicans don’t return to the religion of the checkbook, I don’t see Republicans hanging around,” Johnson said. After the march on Washington, Governor Johnson was scheduled to travel to Cleveland, San Francisco, Texas, and New Hampshire. He conceded that he would not have a chance to be home in New Mexico for at least three weeks. Update: Governor Gary Johnson will appear in Charlottesville on Friday, September 17. He will be speaking in Jefferson Hall on the West Range at the University of Virginia at the invitation of the Jefferson Literary and Debating Society. His speech begins promptly at 7:29 p.m.